Route 26 is proposed to be eliminated and replaced by a local/express bus with terminal points at Masonville Place and White Oaks Mall. The express portion of the route would run between Masonville Place and Commissioners. South of Commissioners, the Route would provide local service along Route 26’s current routing. 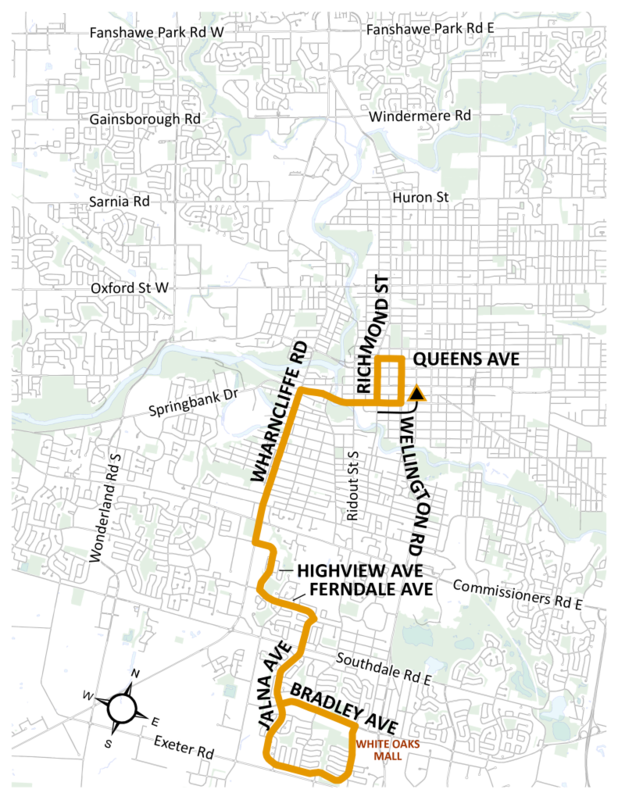 Wharncliffe Road is notably missing a direct north-south route connecting major destinations in the north (Masonville, Western University) with the dense corridor of Wharncliffe Road in the south. A direct route would also reduce the need to transfer downtown for many in the south end travelling to the north. 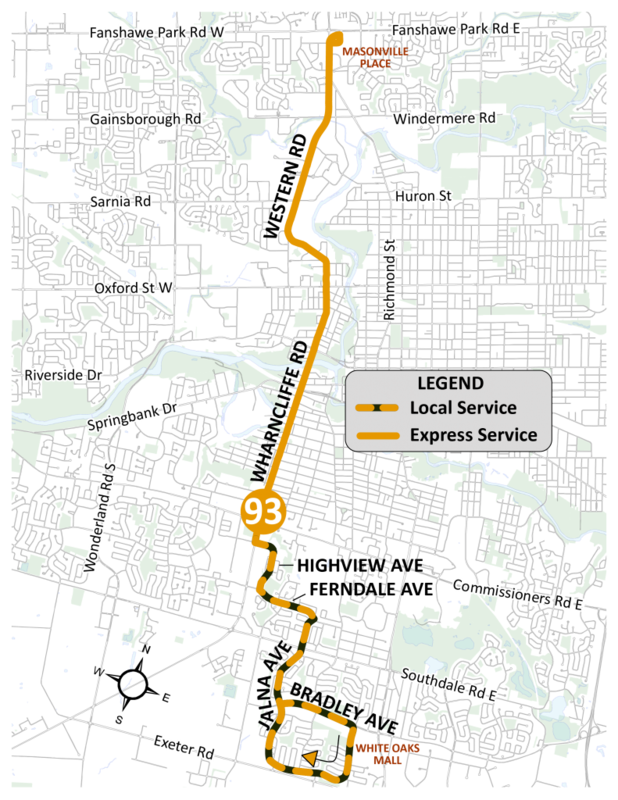 The plan for an express route on Wharncliffe Road is part of the original Post-2019 Rapid Transit Implementation Framework Plan. Currently, there are reliability concerns on Route 26 that will temporarily be addressed on November 25 by reducing frequency from 30 to 35 minutes during weekday mornings. The ridership justifies more service frequency and therefore the route requires investment. One of the additional benefits of introducing Route 93 is increasing the capacity between Masonville and Western University. With changes to Route 34 removing southbound service between Masonville and Western, Route 93 can offset the reduction. Passengers who currently use Route 26 to travel downtown would have to transfer to reach their destination. There are many locations and routes to complete this transfer: Routes 11, 12, & 15 on Wharncliffe Road; Route 5 at Horton; Routes 2, 9, 19, 20, & 102 at Riverside. Providing a fast and direct option for passengers to travel north and south on Wharncliffe and Western Road will shift ridership from other overcrowded routes. The proposed change is anticipated to be very positive for the overall network. Richmond Stop Changes – Queens Ave. to University Dr.